What's the difference between a pizza and a flatbread? Well, one is a meal for $20 and the other is an appetizer for $15. 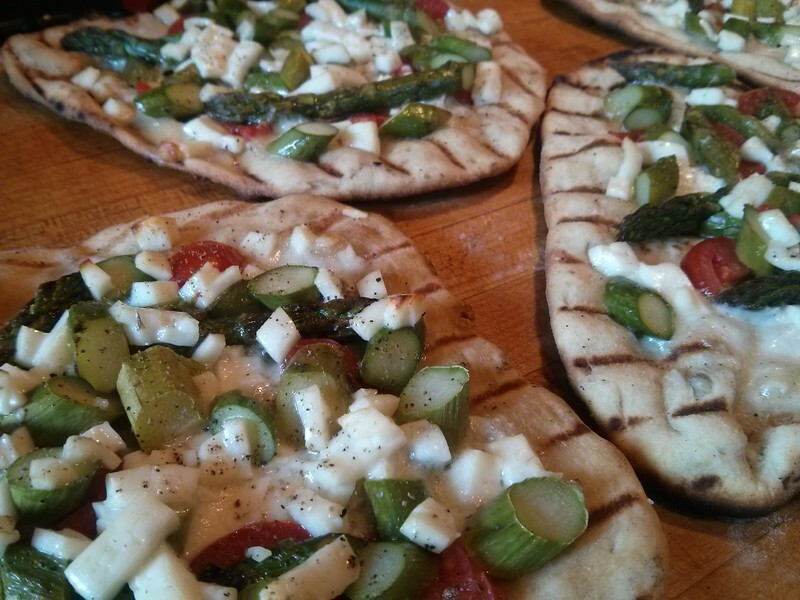 Since these are appetizer-sized, I'm calling them flatbreads. grill for 1-2 minutes, until the bottom is dry and has grill marks. The really important thing for grilled pizza is not to overload it; a soggy pizza will fall apart on the grill. Just put a few scattered toppings on, and nothing wet. This is one such, taking advantage of the second-crop asparagus. 1 bunch asparagus, around 1lbs. Heat up the grill. You're looking for medium-hot grill heat here, around 550F. Grill the asparagus for 3 to 5 minutes (depending on thickness); you're looking for it to be parly cooked here, and lightly seared on one side. Take it off the grill and set aside to cool. Slice the tomatoes into small, thin slices. Slice or dice the mozarella and the haloumi into small pieces, around 1/4" cube or smaller. Divide the dough into four pieces. Roll each into a ball, then roll it out with a rolling pin until it's around 6" in diameter and very thin. Dock the dough so it doesn't puff up too much, using a docker or a serving fork. Paint both sides with olive oil using a basting brush. Put the dough on the grill. You'll have to carefully lift it and drop it on with your fingers; the oiled dough is liable to stick to any pizza paddle. Close the lid and cook for two minutes; in that time the dough should be dry and puff up in little bubbles. Remove from the grill onto a platter. Slice the grilled asparagus on the bias. Use thinner slices for thick asparagus, and cut long pieces for very thin asparagus. Assemble the flatbreads. Flip the grilled breads over so the side with the grill marks is up. Dot each bread with the mozarrella. Add a few slices of tomato. 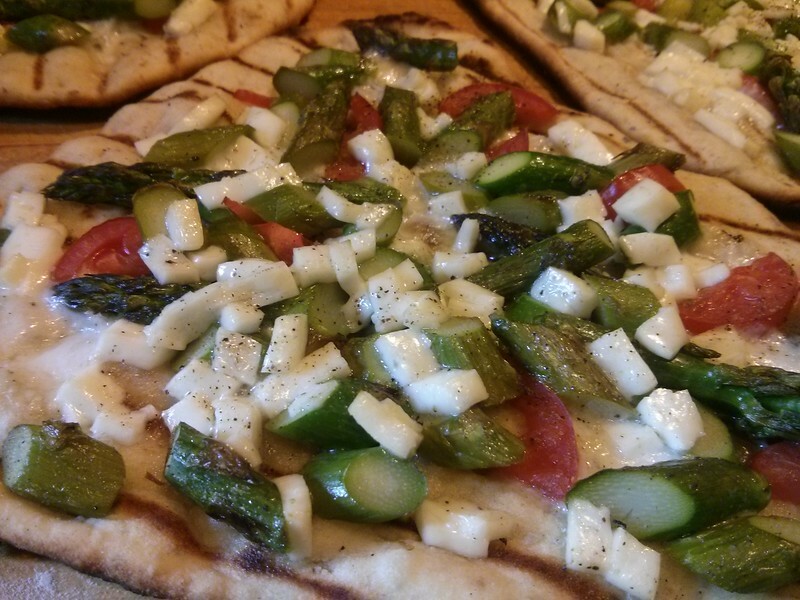 Scatter 1/4 of the asparagus on each bread, and then top with 1/4 of the haloumi. Sprinkle with ground pepper. Do not overload the breads; you want a scattering of toppings, not a thick layer. Slide each bread back onto the grill and cook for about 4 minutes. They're done when the edges are brown, the breads are stiff, and the haloumi has started to soften. Cut each into pieces and serve.